This excellent community sports facility was built by the London County Council in 1937. And, after a period of closure, Brockwell Lido re-opened in July 2007. Seventy years on and it still remains as valued and popular now as it ever was. This lido was once called "The Evian Lido" after the famous mineral water supplier pumped some much-needed cash into the lido a couple of years back. Now, thanks to recent upgrades, the lido represents a magical sanctuary for residents in the south east of the city. Affectionately known as "Brixton Beach", you'll need to use your imagination to hear the sound of the waves but it is a welcome respite from the sweltering heat and a home-from-home for a diverse mix throughout the summer months. The glorious outdoor pool forms the centrepiece of this local leisure attraction idyllically located in Brockwell Park and featuring an excellent cafe overlooking the pool. There is also a safe paddling pool for the smaller tots to splash around in. Framing the pool are a range of rooms that host a number of varying activities including yoga, aerobics and under fives 'Whippersnappers' music and drama workshops. This is a great community resource and a heavenly place to spend a long, hot summer's day; choose a shady patches of grass underneath the sweeping trees, relax and enjoy the infectious, relaxed vibe. Community & Lifestyle, Antiques Fair. Brockwell Lido gyms, sporting activities, health & beauty and fitness. What are the best dining options near Brockwell Lido London? The best pubs near London Brockwell Lido. 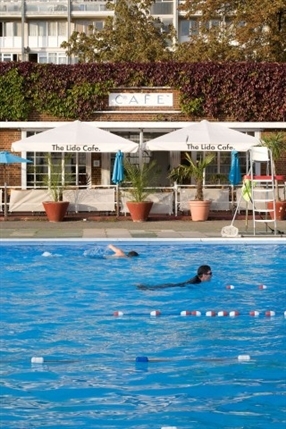 Brockwell Lido clubs, bars, cabaret nights, casinos and interesting nightlife. Where to have your meeting, conference, exhibition, private dining or training course near Brockwell Lido. From cheap budget hotels to luxury 5 star hotels see our discounts for Brockwell Lido hotels, including Holiday Inn Express London- Vauxhall Nine Elms from 71% off.